AspensArt has a shop on Etsy! My shop, Spinneree, contains many interesting items for sale! Here you can purchase original pen and ink pieces, as seen in my galleries. Also available are found item sculptures, upcycled goods, as well as wonderful vintage treasures! Enjoy! AspensArt has a business page on Facebook. I use it mainly to let everyone know when I have something new going on, but it also a nice way to check in with friends and fans. Collections of some of my art are available in my online bookstore, AspensArt. Two pieces of my art were chosen for publication in this colorful and expressive book. It is currently only available through New Art Review. I make no profits from the sale of this book, but I am proud to have been chosen for publication. This is the first blog I have ever entertained. It will, hopefully, serve me as a social networking tool. I welcome all who wish to follow me...and ask for any guidance one may have to offer. 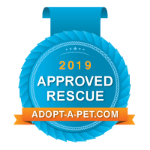 Quality of Life Rehab and Foster is a grass roots effort to increase the quality of life for all animals, especially those in our shelter systems and those injured by run-ins with man. We provide community outreach by means of education, foster, resourcing, and hands on rescue.This is a link to our adoption/foster needs website.